Will 2019 be the year of upsets? 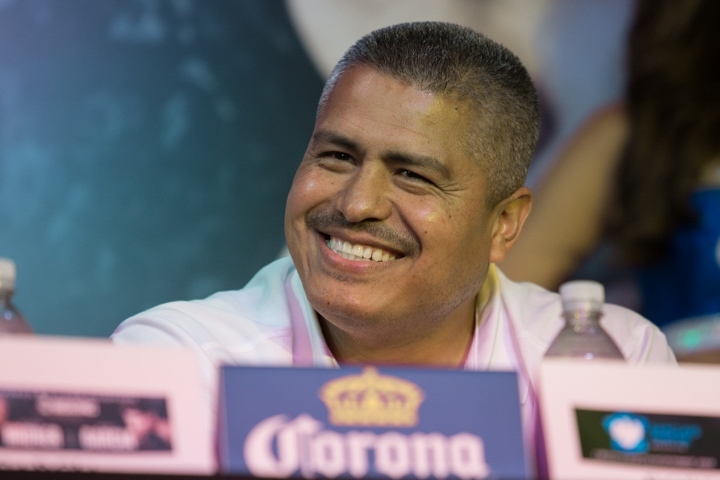 On the heels of a pair of shocking results on Saturday, featherweight contender Miguel Flores and trainer Robert Garcia certainly believe so. The 126-pound Flores (23-2, 11 KOs) cited IBF featherweight champion Josh Warrington (28-0, 6 KOs) retaining his title with a unanimous decision over favored two-division title winner Carl Frampton (26-2, 15 KOs) in Manchester, England, as well as repeat title challenger Tony Harrison (28-2, 21 KOs) doing the same in dethroning WBC 154-pound titleholder Jermell Charlo (31-1, 15 KOs) at Barclays Center in Brooklyn New York. During an interview with BoxingScene.com on Saturday night, Flores also mentioned a December 8 unanimous decision by Emanuel Navarette (26-1, 22 KOs) that dethroned IBF 122-pound champion Isaac Dogboe (20-1, 14 KOs). Their collective efforts serve as motivation for the 26-year-old Flores, who challenges three-division and WBA “super” featherweight champion Leo Santa Cruz Cruz (35-1-1, 19 KOs), a 30-year-old who is after his fourth straight victory in as many defenses on February 16 on FOX (8 p.m. ET/ 5 p.m. PT).). The 26-year-old Flores (23-2, 11 KOs) scored a second-round TKO of Raul Chirino in April to rebound from consecutive sixth- and fifth-round stoppage losses to Dat Nguyen and Chris Avalos in February and July 2017. “I’m watching [the replay] of the Jermell Charlo-Tony Harrison fight right now, and it’s crazy how much confidence these guys [Warrington and Harrison] have in themselves. That just goes to show you, man, that in boxing, anything can happen. You can do everything right in the gym and still lose against a guy who has the right mentality. Leo Santa Cruz has split fights with Frampton and he’s been worried about having a third fight with Frampton,” said Flores. Robert Garcia is training three challengers over as many different months who are massive underdogs entering their respective fights in Josesito Lopez (36-7-1, 19 KOs) and three- and four-division title-winners Abner Mares (31-1-1, 15 KOs) and Mikey Garcia (39-0, 30 KOs). Lopez faces WBA “super” welterweight champion Keith “One Time” Thurman (28-0, 22 KOs), who ends a 22-month, injury-caused ring absence with his third straight and fourth overall appearance at Barclays Center in Brooklyn, New York, on January 26. Thurman’s eighth defense is being televised as Premiere Boxing Champions returns to FOX (8 p.m. ET/ 5 p.m. PT.). Mares and Mikey Garcia are rising in weight to challenge younger, left-handed 130- and 147-pound champions Gervonta Davis (20-0, 19 KOs) and Errol Spence (24-0, 21 KOs), a duo perceived to have superior advantages in size, speed and power. Mares moves up from 126 with the goal of dethroning WBA “super” champion Davis for his fourth crown in as many divisions on February 9 live on Showtime from The StubHub in Carson, California. “Tank” Davis ends a 10-month ring absence in pursuit of his 12th straight stoppage and successful second defense. Mikey Garcia is making his 147-pound debut and seeking his fifth crown in as many divisions against “The Truth” Spence, who is after his 12th straight stoppage and third defense on Fox at 9 p.m. ET/ 6 p.m. ET on March 16 at The Dallas Cowboys’ AT&T Stadium in Arlington, Texas, near Spence’s home in DeSoto, Texas. “Are you serious?” was the response of Robert Garcia upon being reached while on vacation in Mexico and informed of Saturday evening’s Warrington-Frampton and Harrison-Charlo upsets.